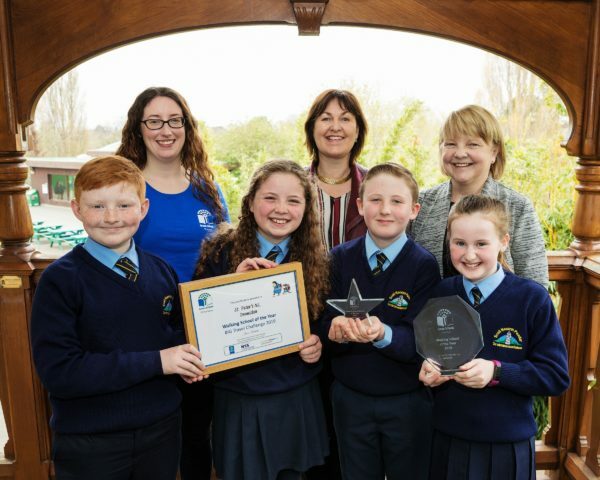 Thursday, April 11 2019: St. Peter’s National School from Dromiskin in Louth was today named ‘Ireland’s Travel School of the Year’ at a ceremony in Dublin Zoo. Green-Schools presented the school with their award at the event honouring the winners of this year’s Green-Schools Big Travel Challenge 2019. Ten other schools were also awarded on the day for their efforts promoting sustainable and active travel modes to school. During February schools undertook the Big Travel Challenge, which asked them to concentrate on one sustainable transport mode for two weeks to see if they could achieve real, lasting change in the travel behaviour of their staff and students. The Challenge is an initiative of Green-Schools Travel, which is supported by the NTA and the Department of Transport, Tourism and Sport. St. Peter’s National School, whose 240 students and staff members come from the Dromiskin area, concentrated on walking, beginning their challenge with 100 students and ending with an outstanding 207 students opting to travel to school on foot. To spread the message of sustainable, active travel the Green-Schools committee visited each class in the school to the run up to the challenge, and used their Twitter account and good relationship with community groups like Tidy Towns to spread the word that they were focused on walking to school. Ten other schools were awarded for their part in establishing green travel modes like cycling, scooting and using the park ‘n’ stride option to school as part of the BIG Travel Challenge today.